While they're essential to manufacturing everything from the case around your cell phone to the gas in your car, catalysts -- molecules that drive chemical reactions but aren't consumed by them -- are not always well understood. Take the case of a catalyst made from palladium particles. The size of the particles seemed to determine if the catalyst drove the reaction to create methane or a different compound. Knowing why would let scientists pick the product. Recently, a team from Pacific Northwest National Laboratory determined that the key difference between small and large metal particles was their ability to provide active hydrogen atoms. It is the abundance of active hydrogen atoms on the large particles that promotes the formation of methane from carbon dioxide and hydrogen. On the smaller particles, less hydrogen is available, so the catalyst produces a different product: carbon monoxide. Why It Matters: Biofuels could ease economic, environmental, and security issues that dominate our nation's energy landscape. Agricultural wastes and other bio-sources contain massive amounts of carbon dioxide that could become the building blocks for methane and other simple fuels. To design innovative large-scale processes that turn waste into fuels, scientists must understand -- and control -- the reactions involved. Knowing why and how the size of the catalyst influences the final products is a vital step in those designs. Agricultural wastes contain carbon dioxide. Harvested from the waste, the carbon dioxide could become the building blocks for methane and other simple fuels. Scientists recently uncovered key details about turning that recovered carbon into fuels. Stock Image. Methods: The team began by synthesizing a popular metal catalyst, palladium on aluminum oxide. They prepared two samples. One sample has large metal particles; the other, small particles. The team found that the reaction kinetics and associated mechanisms were very similar, regardless of particle size. But careful kinetic studies in a flow-through reactor showed that large palladium particles preferentially produced methane while small ones preferred-or had high selectivity toward-carbon monoxide formation. Digging further, they found that the larger particles provided abundant highly active atomic hydrogen atoms, so the key difference between small and large metal particles was their ability to provide hydrogen. 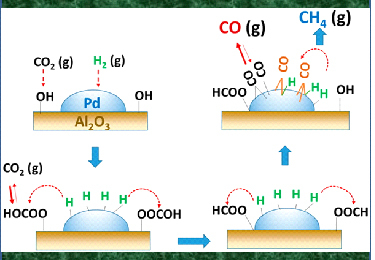 The abundance of active hydrogen atoms on the large particles promotes the formation of methane. "The availability of active atomic hydrogen is critical in the conversion of carbon dioxide to methane," said Dr. Janos Szanyi, who led the study. "In small metal particles, where less hydrogen was present, the reaction stopped after removing one oxygen to yield carbon monoxide." Thus, by varying particle size, scientists can control the final product. What's Next? Having the mechanistic details in hand, Szanyi and his coworkers are now leading research to further understand the intermediates and the associated lifetimes on the catalyst`s surface. The research will further explain the kinetics information for palladium and other catalysts, including ruthenium and rhodium. "Our ultimate goal is to understand how to control this reaction using earth-abundant metals, such as iron and cobalt," said Szanyi. Sponsors: The catalyst preparation and catalytic measurements were supported by a Laboratory Directed Research and Development project. J.S. gratefully acknowledges the financial support of this work by the U.S. Department of Energy, Office of Science, Office of Basic Energy Sciences, Chemical Sciences, Geosciences, and Biosciences Division. J.H.K. also acknowledges the support of this work by the 2015 Research Fund of Ulsan National Institute of Science and Technology, Ulsan, Korea. One sentence summary: Scientists at Pacific Northwest National Laboratory discovered that on large palladium particles, the abundance of active hydrogen atoms promotes the formation of methane from carbon dioxide, but on the smaller particles, less hydrogen is available and the reaction produces carbon monoxide. In 100 characters or less: Larger particles offer more hydrogen atoms, which determine the fate of carbon dioxide's conversion.